The mission of the CRC is to support the environmental efforts of the maritime industrial community on San Diego Bay. The CRC actively engages with the community through educational and outreach efforts including the clean-up and restoration of public areas that directly impact the San Diego Bay and its tributaries. Since 2002, the CRC has provided partial and/or complete support for 45 community events focusing on runoff that leads to San Diego Bay, primarily within the Chollas Creek Watershed. The CRC works in partnership with Groundwork Chollas Creek, I Love a Clean San Diego, San Diego Port Tenants Association, Port of San Diego, Urban Corps, San Diego City College and many others. As recently as April 2014, the CRC organized a large event at 47th and Castana Street in the Chollas View neighborhood of San Diego. 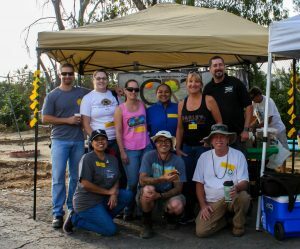 Through this event the CRC removed four large roll-off bins filled with trash and invasive species that have accumulated along a tributary of Chollas Creek. The CRC cleared the area to give the local community a better view of the site’s potential as they work with the City of San Diego and Groundwork Chollas Creek in the design and creation of a future pocket park. This project will not only reduce runoff debris due to illegal dumping, it will also help reduce crime in the neighborhood by the removal of nearly two acres of overgrown invasive species often concealing illegal activities. For eight years, the CRC has also provided care and support for a project known as EarthLab. EarthLab is a hands-on outdoor science laboratory at Millennial Tech Middle School that allows children to learn about environmental sustainability. The grounds consist of an amphitheater, gardens, farmland, trails, compost areas, creek shore and an outdoor seated classroom. Yearly, the CRC helps care for EarthLab by creating irrigation systems, building trails, mulching, fence repair, bench construction, weed abatement and much more. Since 2010, the CRC has also been involved in a large project at Radio Canyon in the neighborhood of Encanto. The area contains tributaries that run off into Chollas Creek and open space for residents to enjoy. It also serves as a portion of the habitat that is being preserved for the Cactus Wren and Gnatcatcher Restoration Program. Groundwork Chollas Creek has relied on the CRC to gather volunteers for non-native plant removal, planting of native flora and trash removal. These actions help provide a complete habitat for all aspects of the Cactus Wren’s ecological needs. In January of 2014, 150 CRC volunteers removed 14 tons of non-native plants and 12 tons of trash and debris from Radio Canyon. The volunteers also planted a total of 500 native plants that were propagated at EarthLab. As with most CRC activities, this event was made memorable for both the volunteers and the community with a BBQ, raffle and educational and craft projects for kids. In addition to these CRC sponsored events; we are long standing supporters of the Port Tenants Association’s Annual Operation Clean Sweep events. The CRC also provides support and supplies to San Diego City College, the Urban Corps and neighborhood Canyonlands chapters when extra materials are available or between our CRC sponsored events. The CRC aims to provide an exceptional and engaging volunteer experience for our events. 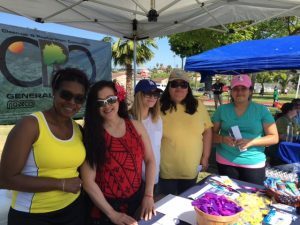 In addition to promoting environmental awareness and restoring areas that form a significant part of our local neighborhoods and ecosystem, we motivate our volunteers and the communities we serve by providing raffle prizes, food, tools and T-shirts. To help pay for these items, CRC members took it upon themselves to raise funds by starting and maintaining a can recycling program at NASSCO’s shipyard. CRC members stay late, off working hours, one workday a month to sort the cans collected throughout NASSCO and bring them in for recycling. This is a job that the committee members selflessly do to better the volunteer experience and give back to the community.